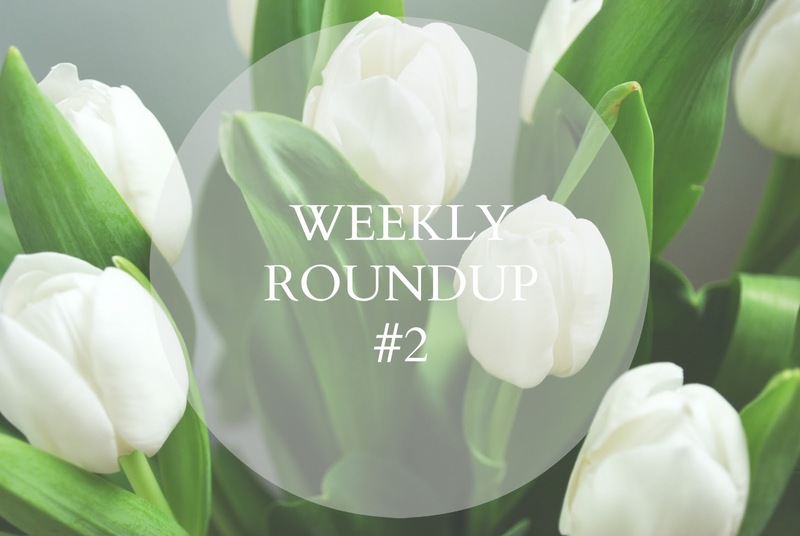 I can't believe it's been a week since I uploaded the first weekly roundup! I know everyone says this, but time really is going so quickly. How has your week been? I had a fairly slow start to the week and then a couple of lovely days out from midweek onwards, and the glimpses of Spring-like weather we've seen have got me feeling rather bright and positive. Funny how the weather has such an impact on our mood, isn't it? :: After a quick trip into town on Wednesday morning, I spent a little time walking along the seafront before heading to the market to pick up some flowers (see them up there?). I adore those afternoons when you can just slow down a little and mooch around at your leisure, indulging in the simple pleasures like the sun on your skin, the sound of the sea or a bunch of fresh flowers (or all three, in this case!). :: The impromptu dinner date Nick and I went on on Thursday evening. What started as a drink or two at the beautiful Grow 40 'just because' soon became an entire evening out in celebration of some good news. While we finished our drinks we deliberated over where to go for dinner, and before long we settled on La Choza, where they serve some of the best Mexican food. Nick opted for a smoked pulled pork burrito with pico de gallo salsa, while I chose the spicy squash and sweet potato burrito bowl with green tomatillo salsa, with the dairy swapped for guacamole. For a little over £20, we each had a meal and a drink, and left feeling well and truly stuffed (and satisfied!). :: Getting back into a fitness routine. As I mentioned in the last weekly roundup, I'm trying to get my fitness back on track, and I'm proud to say that this week I've done pretty well with it and am actually really enjoying it! Perhaps it's the brighter mornings or a result of following a couple of fitness accounts on Instagram, but I'm feeling really motivated at the moment, and am already seeing and feeling the results. I've been doing mostly HIIT, but I've also been for a couple of runs and have done a few toning workouts as well, and I'm really enjoying playing around with my regime and mixing things up. :: Of course, the flowers I picked up from the market. I was hoping to find some peonies (thanks to Instagram I'm on something of a mission to find some), and although I didn't have any luck, I did find these beautiful white tulips. Tulips are something of a symbol of Spring, and I love that these ones are white, too - they bring so much light into the room, and of course fit in with my love of monochrome! :: Neal's Yard Remedies' moisturisers. My current moisturiser has almost run out and I quite fancied trying something new, particularly since the warmer months are approaching and I'm more than likely going to want to be using a lighter product, so I popped into Neal's Yard to ask about their selection. I was very kindly given several samples of different moisturisers, and I decided to start with the Orange Flower Daily Moisturiser since it has a very light consistency but is still perfectly hydrating; similar to Origins' GinZing, but slightly less gel-like. My skin tends to be a little temperamental and even the gentlest and most natural of products can lead to irritation in the form of a breakout, and unfortunately that happened with this particular moisturiser, so yesterday I switched to the Almond Moisturiser, which is quite a bit thicker but still not at all heavy. Once I've trialled all of the samples and chosen a favourite, I'll be sure to report back! :: Avocados. Okay, so avocados are always a highlight for me, but this week we got some particularly large ones in our grocery shop, and they were perfectly ripe, too! Mostly I've just been eating them plain as part of my lunch, but on Friday morning I smashed half an avocado onto a slice of seeded wholegrain toast, then topped it with scrambled egg and a dash of pepper; the perfect lazy morning breakfast. :: Siobhan's oatmeal, honey and coconut oil face scrub recipe. After seeing a picture of this scrub in Siobhan's Studio Sundays post earlier in the week I had been hoping she would share the recipe soon as it looked and sounded divine, and I'm all for a bit of natural skincare (as you may well know by now). So, whilst scrolling through my Bloglovin' feed on Thursday morning, I was very happy to see this post pop up. I don't currently have any coconut oil, or oats for that matter, but I'm definitely tempted to pick some up soon so I can try this scrub for myself. :: I loved reading Beth's post on whether photography is more valued in blogging than writing. Like Beth, although I studied photography at A-level, writing always has been and likely always will be my passion, and it's the primary reason I started Namaste, Rowan. However, I do also realise that photography more often than not plays an important role in the appeal and ultimately the success of a blog, which is something I feel somewhat conflicted over. I did originally write a rather lengthy paragraph on the issue but felt that it was a little too in-depth for a weekly roundup, so I've decided to keep this short and write an entire post on the issue instead, which will be popping up in your feed some time in the next week. In the mean time, if you haven't already, have a read of Beth's post - she puts her point across really well, and I think what she says will speak out to a lot of bloggers. :: Grace's blog is perhaps one of my favourites, and this week her post about SUQQU's DIY facial has got me seriously craving a facial massage, be that at the hands of a professional or my own. I often like to give my jawline a little massage whilst applying moisturiser in the evening to push out any excess fluid and ease any tension, but I've never given myself a full-face massage before. However, after reading Grace's post, I think that might have to change. :: 5 Ways To Flower-fy Your Home on A Little Opulent. There's a bit of a floral theme in this post, but since this is the week we officially entered Spring I feel it's quite appropriate. I've been keeping my blooms in a tall glass (not for presentation purposes, but simply for lack of a proper vase), but now that buying flowers has become more of a regular thing I'm thinking about picking up a mason jar, or perhaps an I'll try one of the methods suggested by Charlotte in this post. I hope you've had a lovely week, and if you were lucky enough to see the eclipse on Friday, I would love to see some pictures (if you have any!). If not, feel free to fill me in on what you've been up to and what the highlights of your week have been. Thank you for the lovely mention! I'm so glad you enjoyed reading it and could relate to it (especially as someone who studied photography!) Your photography and writing are both spot on though - those flowers look gorgeous! You're more than welcome! As I said on Twitter, it was refreshing to hear someone speaking openly about it. Aw thank you lovely, you're too kind!